Smaller copy print of KTop 13.88.f. 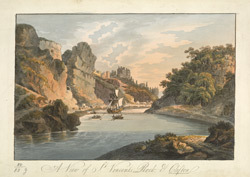 View of St Vincent's Rock at Hotwells near Bristol. The Rock is one of the largest springs of the Hot Well. It rises at 60 gallons per minute and has a temperature of 76 Degrees F. During the later 18th century, Hotwells was promoted as a spa and health resort for ailing gentry. This dramatic, rocky gorge around Vincent's Rock was frequently drawn by artists of the time.